Pactron is an ISO 9001 and ISO 13485 registered full service Contract Manufacturer (CM), committed to the highest standards of excellence in quality and manufacturing. In conjunction with its NPI services, Pactron offers its customers a highly integrated environment to move from prototype to production in dramatically compressed time frames. Pactron offers its clients a comprehensive approach to New Product Prototyping – typically picking up the new product design at the schematic stage and delivering a small number of tested prototypes on a quick turnaround basis. On the design and layout phase, Pactron deploys an integrated design platform that includes board simulation to ensure the design’s signal integrity. With a majority of operations performed in-house - at a high degree of efficiency, Pactron achieves a very high level of customer satisfaction on both quality as well as its delivery commitments. Pactron can process schematics in a variety of industry standard tools, including ORCAD and Cadence Concept. If required, Pactron will engineer the schematic from block diagrams supplied by the customer. Pactron’s design team is highly proficient in a variety of layout technologies, including High Speed design and Analog RF design. 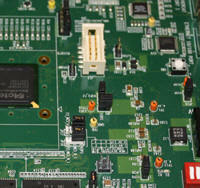 Pactron offers its customers a choice of Cadence Allegro and Mentor PADS as platforms for design layout. Pactron deploys Cadence’s simulation tool, SpectraQuest for both pre and post route analysis. Deploying the signal integrity check, particularly for complex designs, can cut down on the total development cycle by reducing the risk of prototype “re-spins”. Pactron deploys the ECAM tool to surface DFM issues at both the PCB as well as assembly levels. Pactron recommends the implementation of JTAG Boundary Scan for board test. Pactron will implement the requisite Scan-Chain in the design and develop the necessary programs to ensure maximum test coverage. Pactron’s deploys a full-fledged ERP backed Material Management system to help coordinate the just-in-time procurement of components. Pactron has broad access and longstanding relationships with component distributors and manufacturers to help track down and procure long lead time parts in a timely manner. Pactron audits and qualifies its key suppliers, particularly its PCB vendors, on a frequent basis to ensure superior quality and technical compliance. Pactron’s highly experienced manufacturing staff in conjunction with its state-of-the-art assembly shop is well equipped to respond to the most challenging of board assemblies. A short list of assembly capabilities is listed below. Pactron recommends JTAG testing for boards that have BGA devices, particularly BGA devices with a fine pitch and/or a high pin count. Pactron will implement the scan chain during the design layout phase to maximize test coverage. Pactron will also develop the test program for testing and debugging the assembled prototype, thus ensuring the delivery of a prototype set that is fully tested and ready to power-up for functional evaluation. Flying probe test is another option that Pactron offers its contract manufacturing clients.